"Remember Me, I shall remember you". Lasting between one and three hours, the ceremony of remembrance formulates a microscopic mirror of the reality of existence. The motion of the dhikrullah reflects the revolving of the spheres. In the spiritual dimension the process of centering in Allah and finding Union with Him is described. The ceremony reiterates the stages of Ascent towards being lost in Allah (fanafillah) and the stages of Descent to the plane of manifestation, where one remains subsistent in Allah (baqabillah). Thus the Path to perfection that the sufis have vowed to follow is shown in concentrated form in the ceremony of dhikrullah. wa Allahu ya'alamu ma tasna'aoon. And Allah knows the (deeds) that you do. From outward form, one of the most stricking difference between those who follow the Path and Science of Purification (Tasawwuf / Ihsan / Irfan / Sufism) is that the Sufis stress on loud (in some cases silent) zikr (also written as dhikr), whereas the non-Sufis don't place such importance on zikr. The centrality of zikr or remembrance that Sufis follow comes from the Quranic instruction as well as that of the practice of the Prophet. The Quran says, "Zikhrullahi Akbar" (Remembrance is the sublimest) and the Last Prophet through out his prophetic mission, in his community, in his mosque practiced the remembrance in assembly with his companions.Thus one of the hallmarks of sufi circles is the practice of remembrance (zikr). As I came back from USA about one year back where I was blessed to sit in the Zikrs circle of different sufi tariqas or path such as Nur Ashki Zerrahis, Silent zikr of Naqshbandiyya-Mujaddidiyya, Sufi Order International (Chishti), Oveyssi Shahmaghsoudi, Naqshbandi-Haqqani, Qadiri and of course my own spiritual family, the Shadhiliya circles. As I traveled and lived across different states (California, Virginia, Colorado) in US, I was blessed to be near these groups and was welcomed graciously to join in. Mostly all of these gatherings were held at least on weekly basis and apart from that on special occasions such as the death anniversary of saints and blessed days of month. Since returning to my home country, Bangladesh I was increasingly feeling thirsty of such zikr circles and my spirit began to miss them (those who been to sufi zikrs and tasted such gathering will have a better understanding what I mean). So I was increasingly looking for zikr circles near my locality. I found one at a tomb of a sufi saint who is from Qadiri sufi lineage where during ramadan (the blessed month of fasting and abstinence) I joined few times. Then one day I went to the Mosque adjacent to the tomb of a great Sufi Saint, Khawaja Sharfuddin Chishti who is famously known as Wali of Bengal (Bengal's Friend of God). The mosque is quite big and the maqam (the tomb) attracts many many devotee from far and near who come to visit the saint for blessings. Here at this mosque I am given the opportunity to taste zikr and salawat (reciting benediction to the Holy Prophet) in grand scale. Every Friday after Jumuah Prayer (weekly congregational prayer at noon time), a large audience stay back to join the zikr. Its about close to thousand people or more and the zikr is awesome thanks to the baraka of the living saint, indeed the Friends of God never dies. There is no need to go outside. 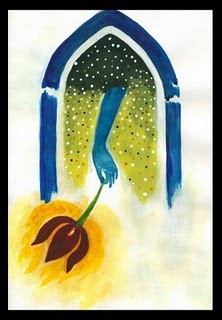 In zikr the tongue becomes the flower of mahabba, flower of ishq - flower of divine love. Since love holds the greatest of secret in the entire cosmos, one of the reality of Islam is the quintessential love for habiballah, the beloved of Allah, Prophet Muhammad Mustafa. So the essential practice in the zikr is singing and chanting of holy benediction to the Prophet which if practiced with focus and with understanding, creates an indescribable love in the heart of the devotee. In zikr, the zakir (one who remembers) wash himself of himself. The result is an experience of deep longing, followed by weeping and sobbing that washes away every worldly concern, worries or attachments. The salawat part is done using a number of devotional singing to the Prophet, both in the arabic, persian and bengali language. At this point the body sways, the heart quickens, the eyes over flow with tears which comes neither from grief, nor from sadness but from an overflowing of love for this illuminated being and finally the soul years with an unprecedented yearning. At this stage, those who are present are given an uniquely precious moment. I remember on many occasions, the head of the participants bow in the inner feeling of being transported in the presence of the Beloved Prophet, may our love for him be perfected both within and without. Infact whether a salawat or sending blessing to the Prophet is accepted or not is realized through this state. If in the ceremony one feels that one is standing in front of the presence of our Master, one can be certain that the benediction reaches him and he sends his return blessings upon us from his loftiest spiritual station. When you feel the presence of the Mystic Master, Grand Shaykh of all shaykhs, a great shame covers you because you start to see your unworthiness infront of the beloved of God, Muhammad Mustafa. And when your heart continue to sing salawat, you feel even unworthy to sing in his presence and a special haal of being ashamed of one's own station pulls the heart. It feels like only one could become nothing, then this feeling of one's smallness in the presence of the chosen one would go away. The indescribable devotion and love follows because in the presence of the beloved, the lover becomes nothing, and the beloved becomes everything. True ashk melts the lover, only beloved remains. If you are a lover of Christ and if you experience what it means to be transported to his presence and his gaze is upon you - then perhaps as a devoted Christian one can understand what it means. In Islamic practice the imitation and love and devotion for the Prophet Muhammad are of a higher note than any other faith tradition and made much more intimate through the daily practices. Thus this experience of his presence during the salawat is really something else. During these zikr I was inspired to record the audio produced during the zikr, the collective sound of chanting the holy Name of the Divine and invocation of blessing to the Prophet. I'm not sure how much the effect is preserved in the recording of the sound of the zikr, as compared to those who participate - still I felt like sharing with you. Ofcourse being there in the presence of the saint's tomb, to participate vocally in the chant, absorbing in all the rising and falling vibration is a wholly different experience, but at least in the audio you might catch a glimpse, no matter how faint it is. The zikr starts by reciting, 'Astaghfirullah' The meaning in full is "I seek forgiveness and I turn wholly to Him, my Lord. ", la hawla wala quwwata illa billahil aliyul azim, 'there is no power and might except Allah the Most High'. After that the quintessence of divine unity is pronounced: La ilaha illaLlah (nullus deus nisi Deus / no reality but Allah, the Divine Reality), followed by its haqiqa illa'Llah (only Allah, only You! ), followed by Allahu Allah (the Unique and Holy Name of the Divine Reality) - everything is repeated 33 times or more. Hasunat jami'u khisaalihi, Sallu 'aleyhi wa aalihi. Finally it ends by collective supplication to God. 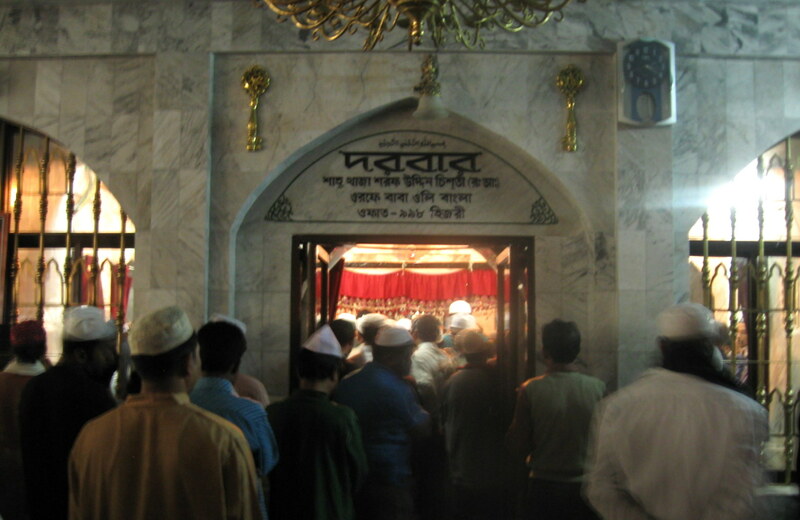 [>] Audio: Click here to download and listen to the audio of Zikr from Jumuah prayer at the High Court Mazar Mosque on the Maqam of Khawaja Sharfuddin Chishti, Dhaka, Bangladesh. then you must walk into the Fire. If you live in Dhaka, I invite you to visit the Mosque of High Court Mazar on Friday. After the Jumuah prayer, stay back for a while (perhaps ten to fifteen minutes) after which the zikr and the salawat (milaad) begins and bask in it. Cover yourself in the love of the Rasulullah and please don't look for anyone while you are there. See His Face only. Those who go there also wish that they be seen by none other than the Majestic Gaze. If you live abroad, then look for a Sufi Mosque (or a circle of Zikr at least even if that be outside any official mosque) that might give you a taste of Zikr. Generally all tomb of sufi saints holds zikr ceremony. Some on Friday after Jumuah, some on Thursday sundown, some on Wednesday sundown. Not every mosque is a sufi mosque. 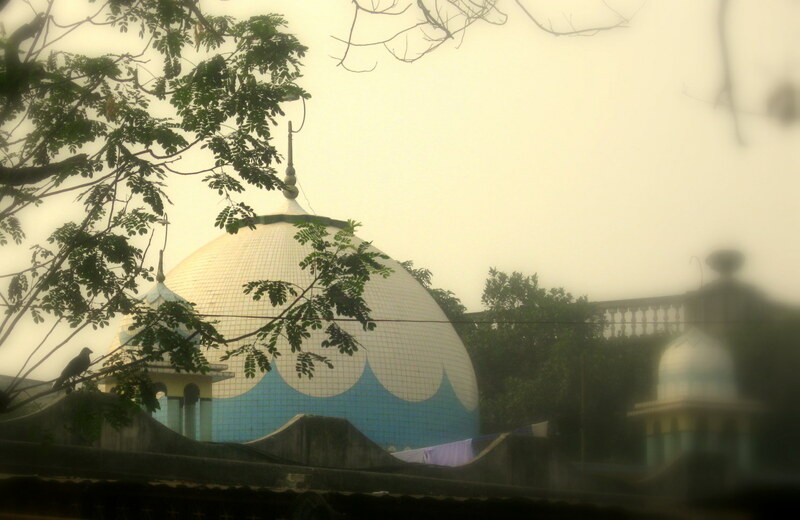 A mosque become sufi mosque when the sufi practices are enliven in it. How would you find / recognize a Sufi Mosque? If you find zikr (divine remembrance and chants) is held in congregation after prayer, then you can be pretty sure that its a mosque run by the people of the Sufi Path (tariqa). Stay and sit there. One contemporary Sufi Shaykha said: The beauty of Islam started to disappear when the zikr disappeared from the mosques. Its so true. So if you wish to see the beautiful Islam, find a mosque where zikr circles are kept alive. The Prophet said, "When you pass by the meadows of the Garden, graze! The companions astonishingly asked: O Messenger of God, What are the meadows of the Garden? And he replied: The gathering of divine remembrance. In the comment section few regular Sufi Circles of Remembrance are mentioned. Try find such mosque near you and I am sure no matter in what city in the world you live in, you will find such a mosque, if not in your town, but near enough for your to be part of it. Dont let any excuse prevent you from that, Inshallah. [>] Also you may download zikr from Nur Ashki Jerrahi Sufi Order recited at Dergah al-Farah, NY.